FEATURE: (1.01.07)-- It's the first day of the new year, and if you partied all night, these three mini-stories related to some top stories we covered last year in regard to the world of Apple will seem like the real thing. Be forewarned, however, that it's purely for entertainment and your enjoyment in order to kick off what we think will be a very exciting year for Mac users--and many future users-to-be--everywhere. MEGA-'BITES'-- Too bad Burger King isn't home of the Big Mac. 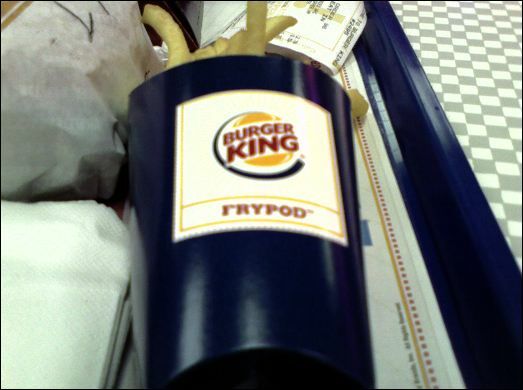 We'd pose the question, "If they sell a lot of Frypods, does it lead to more sales of (Big) Macs?" Boy, would that be a, uh, whopper of a tale! Question is, where does Apple's legal department stand in all of this, considering they've told almost everyone who's coined any term "____Pod," to cease and desist.